Oh, that would be sunshine. 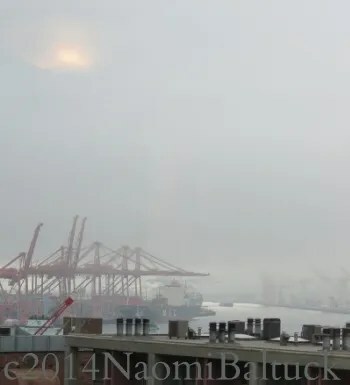 Yes, the sun does shine in Seattle, even more than in Juneau, but so not much lately. Our weather tends to be soft, our skies pastel. It was autumn when we left Seattle last Friday. Two hours later, we stepped off a plane into summertime. The California sky was so blue! The light was intense, and even the shadows seemed to take on a life of their own. 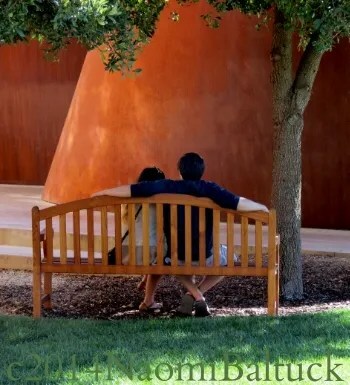 This was most noticeable in the courtyard of the Cantor Art Museum on the Stanford campus, where we saw a sculpture by Robert Serra. It was 200 tons of iron, 13 feet tall, 67 feet long. At first I thought it looked like smoke stacks on a steamer or scrap metal from an old factory. But there is more to it than meets the eye. 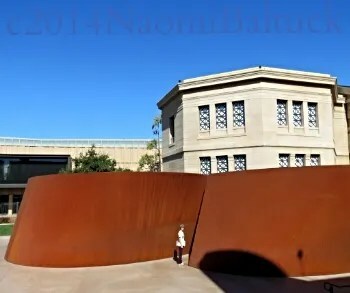 …to interact with…and become a part of the sculpture. The slanting walls were surprising, but the effect was intriguing. We felt like Alice going down the rabbit hole. Each step brought a new view. The interplay between light and shadow and sky was brilliant. …but every one a distinct new creation. Definitely a case of love at second sight. 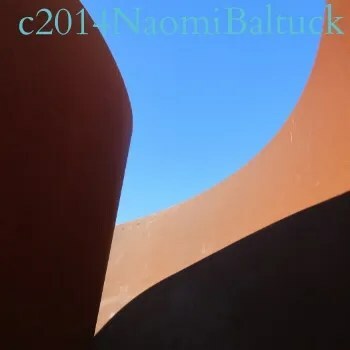 All words and images copyright Naomi Baltuck. Click here for more interpretations of The Weekly Photo Challenge: Abstract. Click here for more interpretations of The Weekly Travel Theme. Yes, very thick walls of rusty iron. Thanks so much for the visit! Great! The pics looked awesome! Thanks so much. I had a quick wander over to your blog, and I loved your last post! I look forward to exploring some more. Thanks for the visit and the kind word! See you soon! Most unusual experience I’m sure, especially from my viewpoint. Am I claustrophobic? It was a little disorienting, but also fascinating. Thanks so much for coming along for the ride! Beautiful photos! You really captured it. Thanks, Bea. You ought to know! What a fun weekend that was, and the museum was really a highlight. The Golden Hour provided perfect light for photos, and any time of day or night you shine! I’m intrigued. I want to see it now. I’m ready to fall in love. 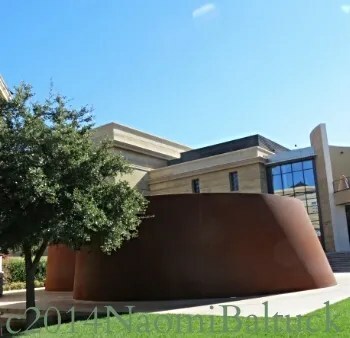 It was interesting to go there and realize that I had been to that museum with Mom on our family trip way back in 1966! Come to think of it, I was there, you must have been too, although the sculpture was a more recent addition. Speaking of falling in love, I really enjoyed the FB photos of your trip with Mark and the kids. Thanks so much for stopping by–it’s always good to hear from you. Let’s talk soon. Thank you for sharing! Blue skies and hidden paths – a perfect scene! Thanks so much for the visit and your generous response. You have been having such a lot of wonderful adventures, but it’s good to know you are home safe and settling back in. 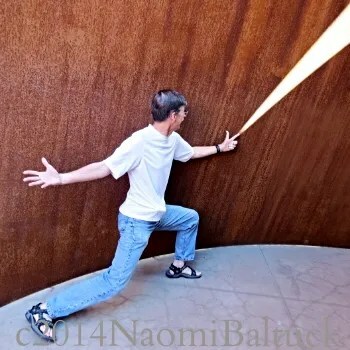 I love that picture of your husband touching the end of the “ray of light”. It really does look like he did that with his fingertip! That was a fun shot–probably my favorite too. Thanks so much for the visit, and for taking the time to share your thoughts about it. You’re welcome! I enjoy my bloggy pen pals and seeing what’s up in their life. Interesting, both place and photos. Thanks for the adventure. Thanks for coming along–it’s always good to hear from you! I hope you are well. Any plans to come visit? Thanks, Sylvia! It’s always fun to play with shadows, and there were so manny opportunities down there for that. I need sunshine, and feel out of sorts if I haven’t received enough. I know a lot of people feel that way–Seattle is just too gray and wet. But at least we get a lot of sunshine in the summer. In the autumn and winter, I just get cozy and burrow in. When the sun does come out, Seattleites are like cockroaches coming out of the woodwork, and can be seen wandering around outside wearing shorts and silly grins, their pasty white faces turned toward the sun. I just wilt in hot weather, and look forward to sweater days in Seattle. But I rarely carry an umbrella, and if I did, I wouldn’t admit it! Love the colours, but it’s sort of dizzying and naked-looking, but also unique and something one would have to spend familiarising oneself with, in order to appreciate it fully. I love your way with words! You describe it perfectly, but unexpectedly. Thanks so much for the visit. 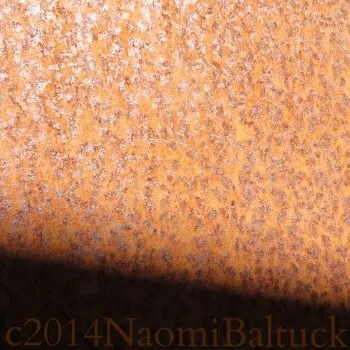 Beauty in rust….you definitely found it, Naomi! Love the photos and all they capture! (Still summer in Oklahoma….two more weeks. Holding on to it! ) Safe travels! Thanks so much for the visit and the kind words. Enjoy your summer! I’m back in Seattle and it is raining BUCKETS! But I’m sure the rain is beautiful! There is something soothing about it. Also, I don’t have to feel guilty about sitting inside and blogging! And it’s a good thing, too, because it has been raining all week! Thank goodness for twinkle lights! Lovely and intriguing. I was just thinking while looking at those photos, imagine if the walls were all mirrors inside rather than the rusty metal what strange and disconcerting views that would create! That would be worse than the fun house at an amusement park! What a trip! After a quick trip over to your blog to read your latest post about hand cream, I can see why you might have been the one to come up with that image. I like the way your mind works! Thanks for the visit, and for making me smile. 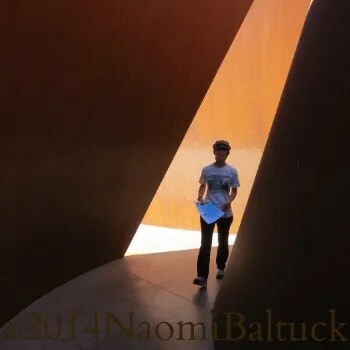 Naomi, I wish you publish a book of “Writing Between the Lines” and share with many other people your beautiful stories and gorgeous photographs. It always amazes me how much you say in a few words and one picture. You are a great poet!!! I recognized shadows. From left to right: Naomi, Thom, and Bea. I am glad your trip was full of sun and discoveries. You are too sweet! Thank you for the kind thoughts, and for taking the time to share them. You pegged us right in the shadows. It was a great trip–short, but we packed a lot into it. Give a hug to Rick and the girls for me. What an amazing abstract! 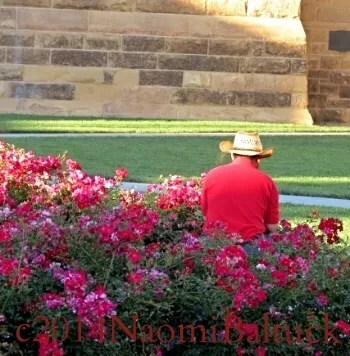 The sun does performance work on many campuses…and canvases, doesn’t it? I am sure you are right about that. 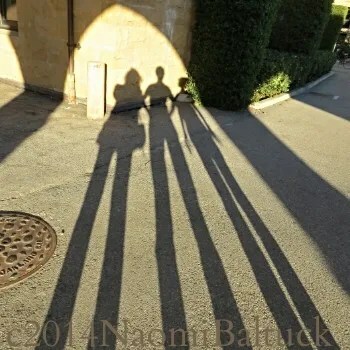 We took lots of shadow shots last weekend on many different canvases on just that campus, and we barely scratched the surface. I hope you are well! 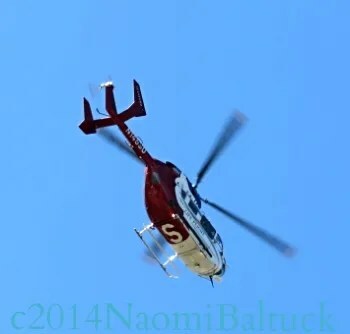 Thanks for the visit and for taking the time to share your response. What lovely photos! Every time I’ve gone to Seattle, the sun has been shining gloriously so I joke that the rain is a myth! My sister’s kids would come frequently to visit, and they were convinced, based on the weather they experienced, that it NEVER rained in Seattle. Thanks for the visit and the story! 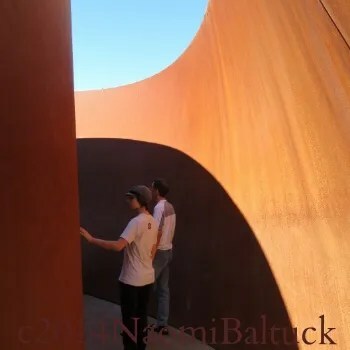 thank you for taking us into the sculpture!! A delightful post as usual!! I’m so glad you dropped by. It is always good to see you! What a wonderful post. Wish I would have seen the sculpture. But I’ve gotten a bit of it, and thank you for that! Thanks for the visit. I’m glad you enjoyed the virtual tour. 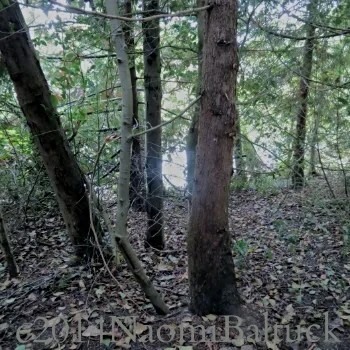 Sometimes that’s the best we can do–I love going on walks with you and Nechama in the local park! A beautiful series…I enjoyed following the lines and patterns. And light! Thanks for the visit. It was really striking. The golden light down there and all that warm stone, especially at that golden hour, makes it easy to take a good photo. But that sculpture was eye candy in the late afternoon light. Love the series of shots and the story you wove around them. 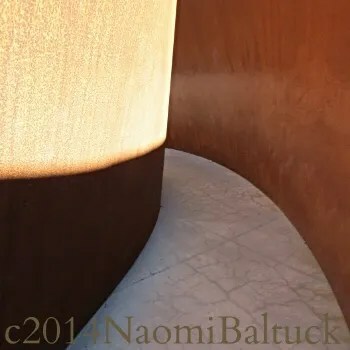 That is a magnificent sculpture and so are your photos, Naomi! These are all neat but I love the one with the long shadows best 🙂 Oh, and the limes!! Thank you! 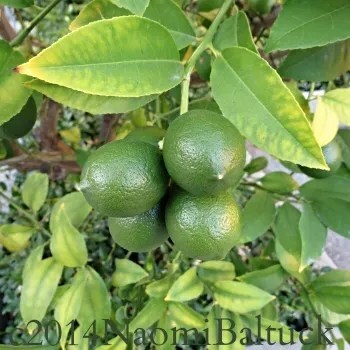 My daughter showed us orange and lime and lemon trees all over the campus. She said that when they ripen, students are welcome to the harvest. Isn’t that cool? Some people have trouble adjusting to our gray skies, but I think they just make the house seem cozier when you come in. Have a great trip to L.A.! The gray is so beautiful out here though. That helps! Yes, I think of Seattle as a silver city. Isn’t it weird sometimes to go from one climate to another in a few hours? I love that feeling, except you have to go back to dreary eventually 😞. 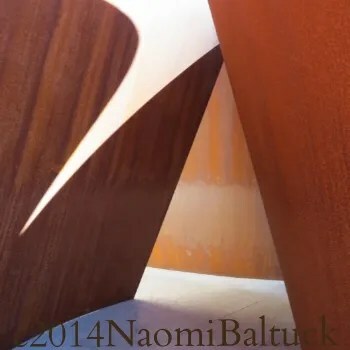 I absolutely loved your abstracts from this shoot Naomi, it presented the sculpture beautifully. well done! Thanks so much. Coming from you, that means a lot. So beautiful and the colours are stunning ~ such an antidote to the darkness falling over Ireland as I write at 16:40! Oh, Jean, the weather in the Emerald City is very similar to that in The Emerald Isle, and while I wouldn’t want to live in California, it was a refreshing break during our rainy season. Thanks so much for the visit. Stay warm and dry! Your perspective on the journey through the figure eights was interesting. Sometimes I don’t take enough time to notice details like that. It was a good reminder that I should. I am definitely a Northwesterner at heart. California is a beautiful state with many natural wonders, but I worked one summer there in the Trinity Alps, and all summer long the only change we saw in an unrelenting blue sky was when wildfires created a haze. I don’t mind the clouds, but it is nice to see landscapes painted from a different palette. I think you have a very good eye–you can recognize story lines and fun facts and find wonderful ways to weave them into your posts. 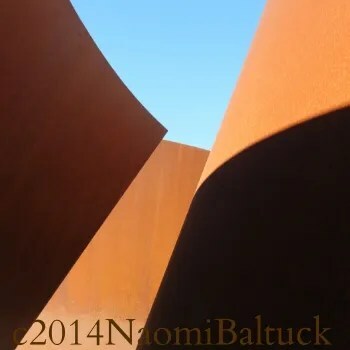 so glad I made it here for this post – what a cool sculpture – and I could feel the rust in a few pics – and could feel the playfulness with the light and shadow and walking – must have been amazing – and I like how you say love at second sight. Wow! What a wonderful thoughtful comment–so full of stories and observations. Thank you so much for sharing it. I love the image of your little guys with the beaters, making figure 8s to be sure it all gets mixed up! Thanks for making me smile! 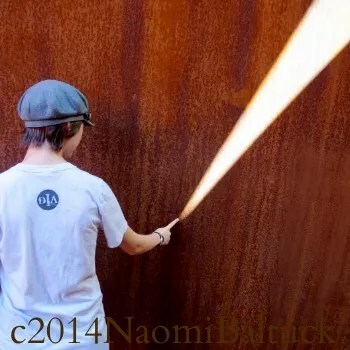 The light seemingly beaming out of the finger…brilliant! It’s like superheroes going through a maze battling bad aliens or something. Love at Second sight, beautiful and inspiring. A fun adventure intertwined with creative genius. Love the sculpture and the great times you and your family had with it. Have a blessed week ahead and all the best to you and your family. Thank you so much. We had so much fun in there, but the light beaming out of the finger was the very best catch of the day! Wishing you and your family all the best–I hope you had a Happy Halloween! What a fabulous job you’ve done here, Naomi. 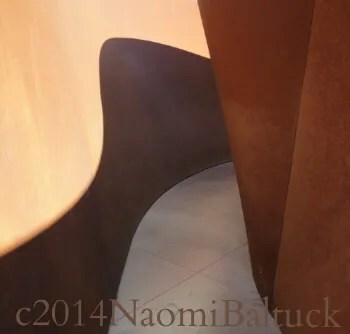 We went through the Robert Serra installation at the Gehry in Balboa, much like this one, and it never occurred to me to even try and photograph in it, let alone that it could become yet another creative art work done by the viewer, in collaboration. If I wore a hat, it would be off to you, and waving its plume. Wow! Thank you so much! I am so grateful for your kind and very thoughtful response to this post! 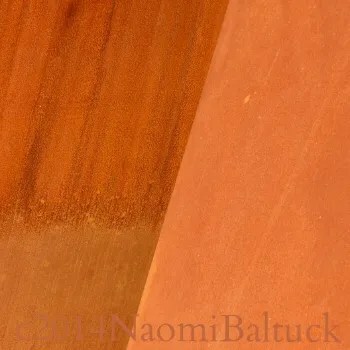 Hi Naomi, I’m reconnecting with your blog I lost it for some reason. I’m re-fallowing you. Thank you, Carol! It is always great to hear from you! I really do miss the soft skies of the Northwest if I am gone too long. Thank you so much for your kind words! I hope you are well. Dear Madhu, Thank you for your visit, and for your generous comment. I think I just happened by this sculpture on a good day!